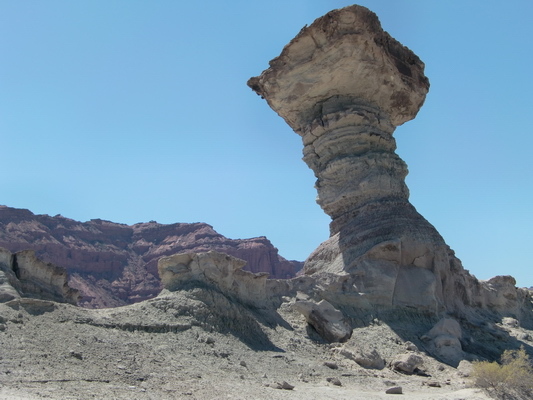 Between San Juan and La Rioja are the National Parks Talampaya and Ischigualasto / Valle de la Luna in the deserts few km East of the Andes. 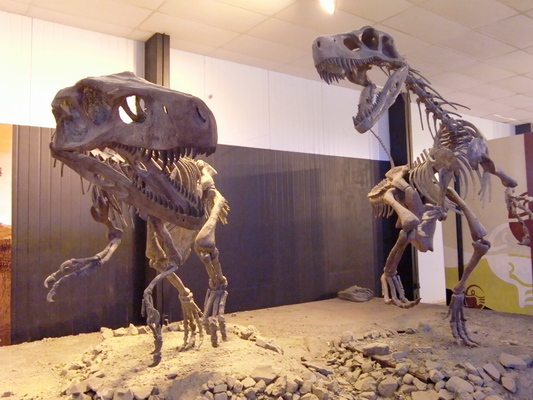 Both are UNESCO world heritages sites and famous for the dinosaurs, which were found there. After our ascent to Mercedario we stayed two days at the very nice camping place Palmar del Lago on the artificial lake Dique Ullum, 30km west of San Juan. In this very dry area we found two Geocaches. Both were in miserably conditions and need consequently some rescue. 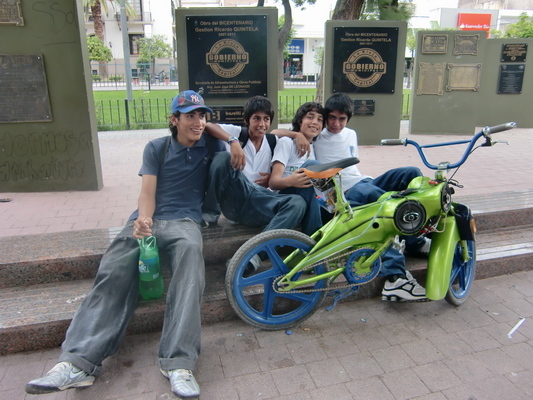 On the first one (Falla La Laja), we were the first who found it after 10 months. The latter one (Ullum) had been found in September 2009 the last time! The road to the Ullum cache was a little bit rough, but we could make it with our car. 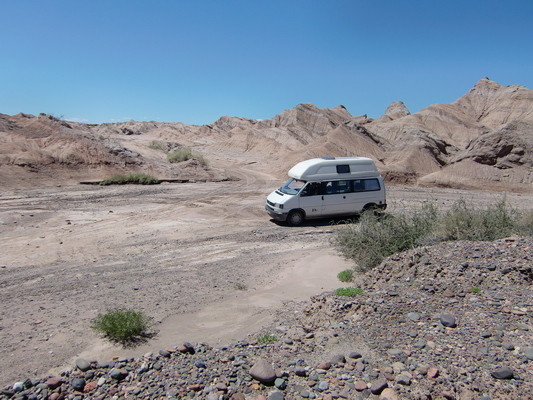 It went along a dry river in the desert on a motocross route. San Juan is a quiet and pleasant City for its more than 300,000 inhabitants, especially between 1:00 and 6:00PM - siesta time. But you have all facilities there like big supermarkets. 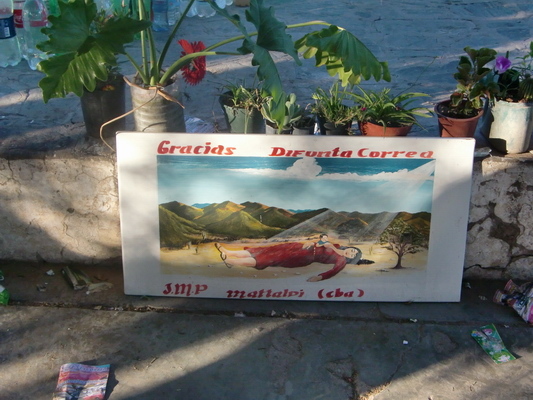 Our next stop was Vallecito, the place in the desert where Difunta Correa had died of thirst mid of the 19th century. But her baby survived, because she had breast fed him after her dead. She is the holy person in this region of Argentina. 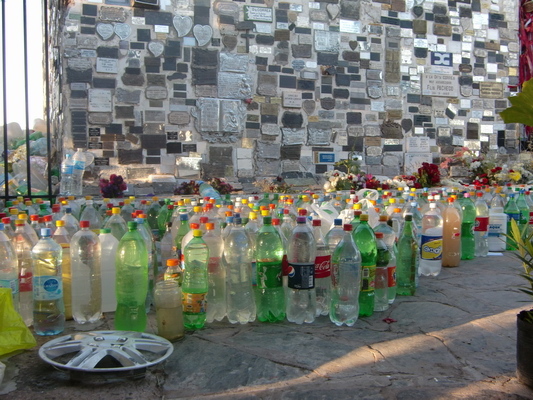 There are many monuments on the roads, all which her picture and a lot of water bottles. 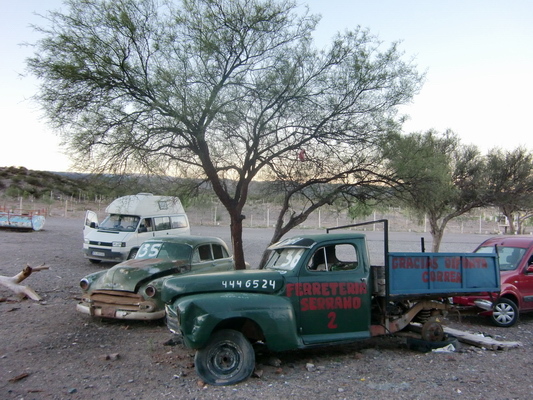 We had a very nice sleeping place behind the Police station of Vallecito besides some ancient cars and behind three horses. 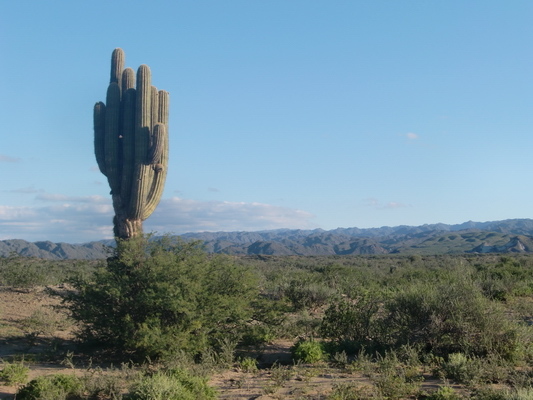 North of Vallecito the landscape becomes more and more desert like and you see enormous cactuses. 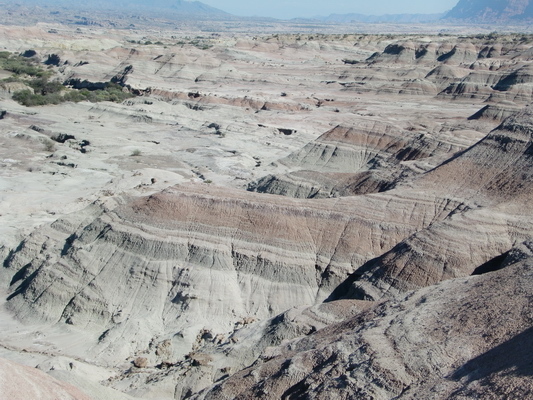 Some of the valleys are green, some are brown and sandy without any vegetation. 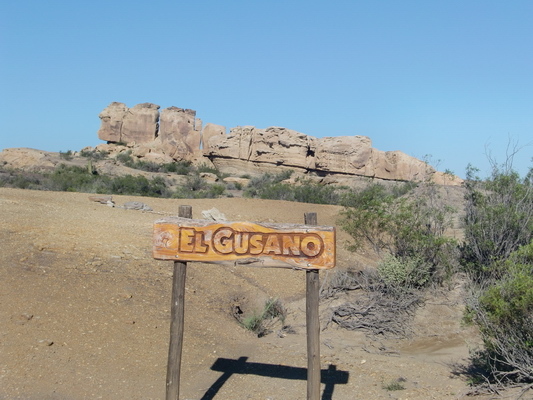 The National Park Ischigualasto has a very nice camp site with electricity and WiFi for just 20 Pesos (5 U$). 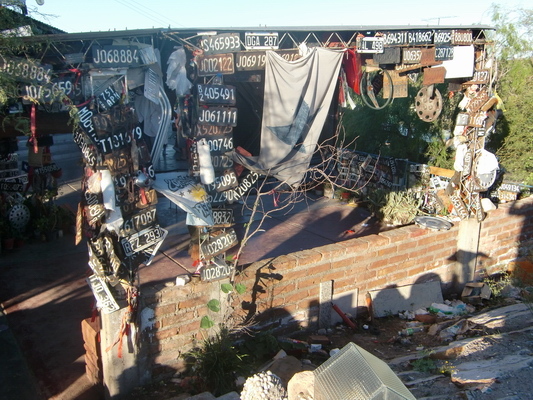 For us it was the cleanest camp in Argentina as yet. To enter the park, you must follow a ranger in your car. The first highlight is El Gusano, the worm. El Gusano it a very old, stoned forest. The second highlight is the Valle Pintado, the painted valley. 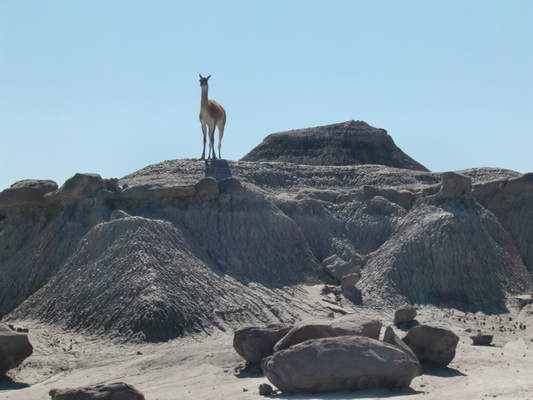 Now the other name of this National Park Valle de la Luna - moon valley becomes obvious. 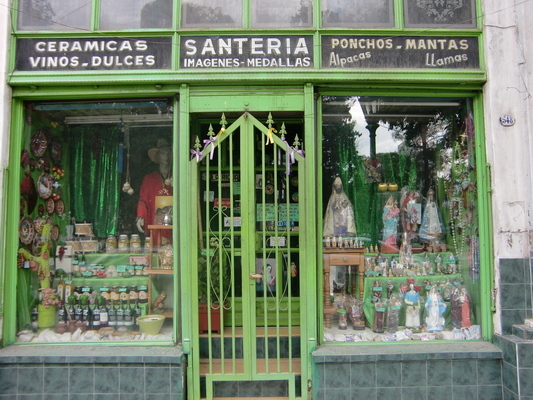 The next highlights are the Cancha de Bochas (shot put place) and the Sphinx. Finally after 4 hours we came to the biggest attraction El Hongo - the mushroom. It is a tower more than 20 meters high and it overhangs at all sides. 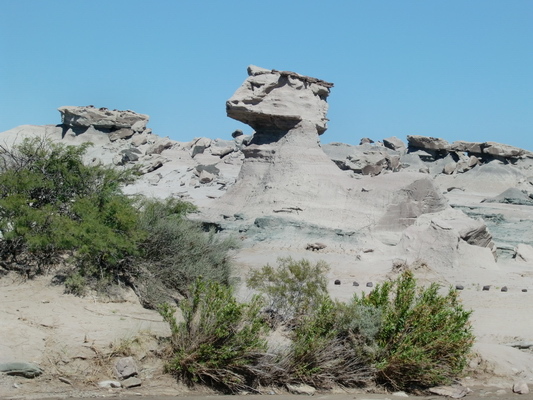 Ischigualasto is very famous for the Dinosaures. 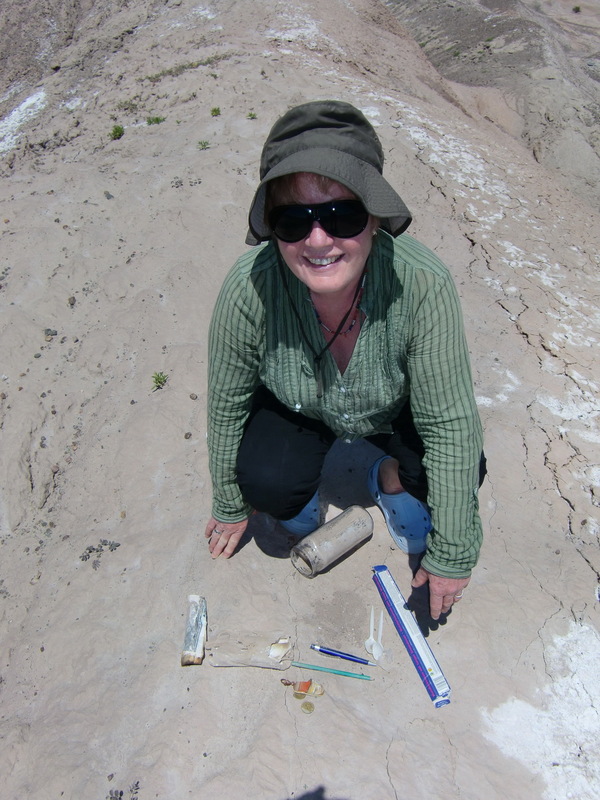 A lot of different species were found there, e.g. 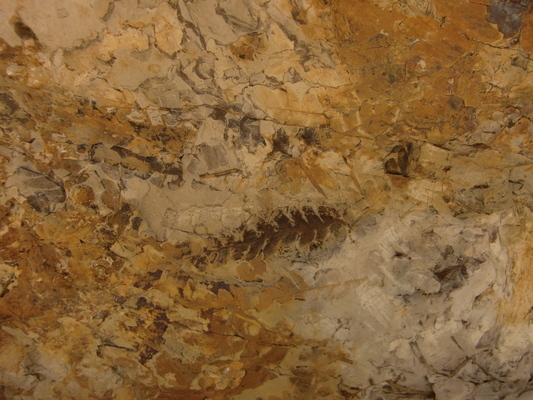 Herrerasourus or Frenguellisaurus, in good conditions thanks to the dryness of the desert. 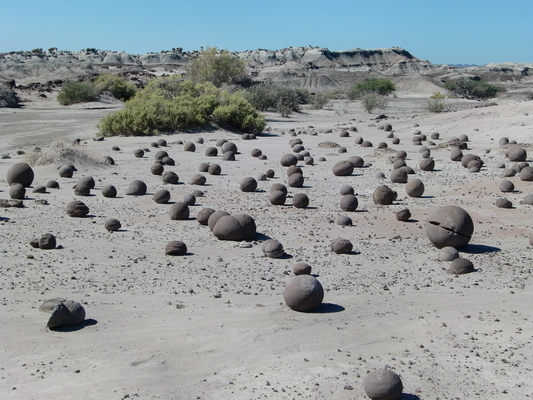 There is a small museum at the park entrance, which shows some replicas of the Dinausoures found in Ischigualasto. The other National Park Talampaya is just 1 hour drive away, but it is totally different to Ischigualsto. Ischigualsto is a wide, desert like landscape with some more or less dry rivers. 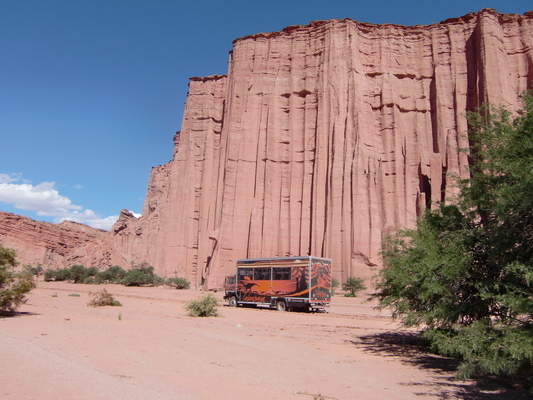 Talampaya ia a huge canyon with vertical, more than 150 meters high walls. The only similarity is the camp, again clean and neat. 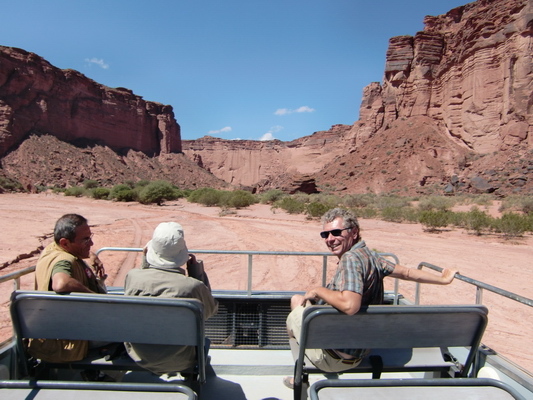 You cannot drive in this canyon with your car, but you can take a truck with a guide into it. The truck has a platform on top of the roof, so the views are excellent. 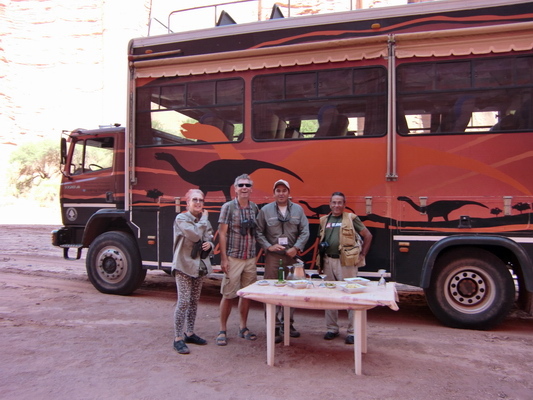 And we were lucky, because with us was only a Spanish couple - a complete truck for 4 visitors! And some food was included in this tour. We had a nice picnic with very good red wind of this region. 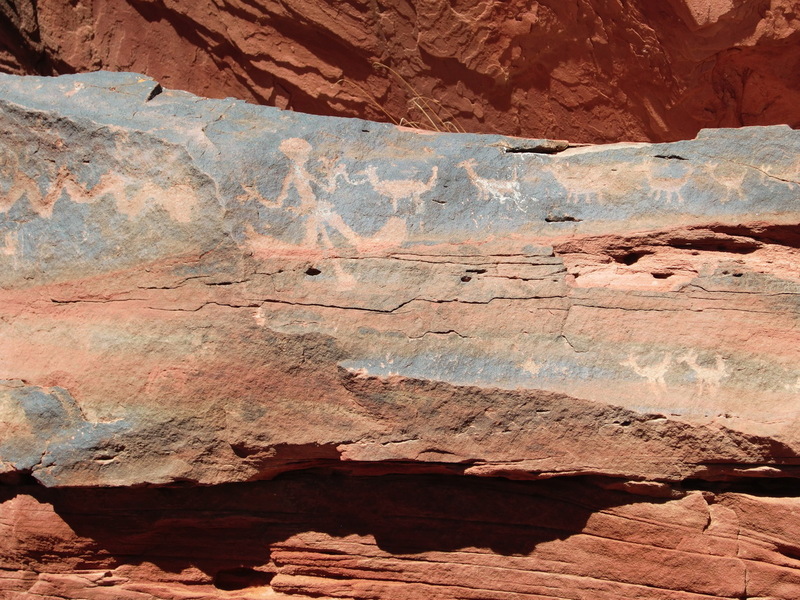 Talampaya is famous for its pictures, engraved approximately 2500 years ago by the indigenous people. Some are incredible clear and beautiful after this time. 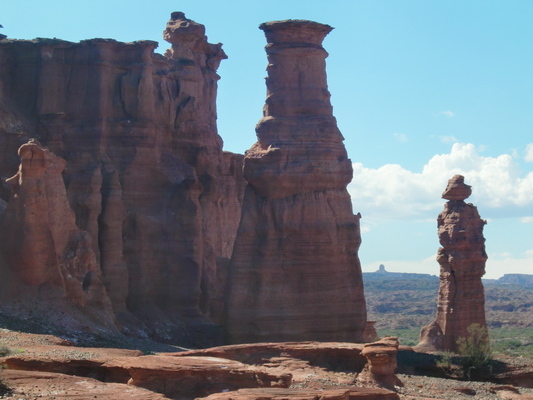 There are stunning rock formations in and at the end of the valley, like an eagle or a monk with his bottle. 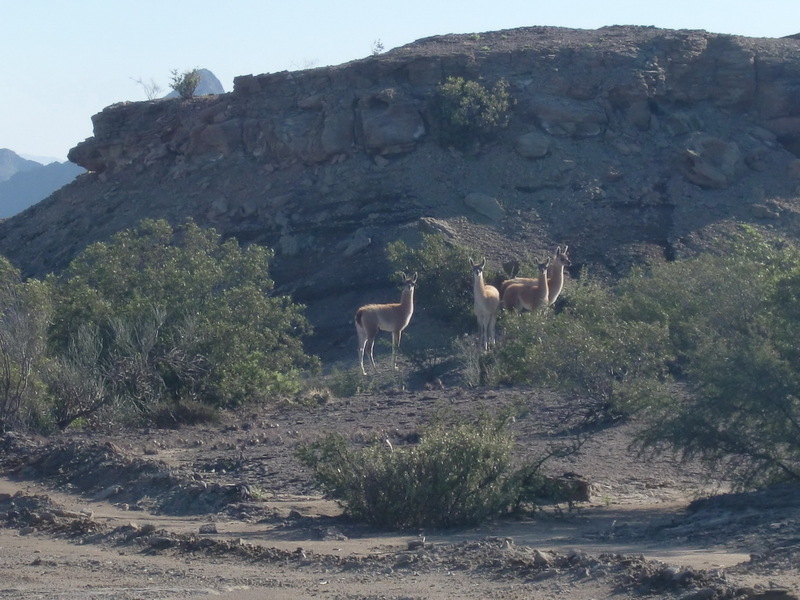 Also a lot of animals were visible in this canyon, like rabbits, frogs and many different birds. We saw two Condors, circling above us. La Rioja, the capital of the La Rioja county is comparable to San Juan, but much smaller (approx. 100,000 people). Originally we had not the intention to drive to La Rioja, but the direct street Ruta 40 to our next main destination, the Paso San Francisco, was closed due to flooding. We were already more than 100 kilometers North of Tapampaya, when it started raining heavily with some lightening. In addition this part of the famous Ruta 40 is not tarred, so the street became very muddy and slippery, soon. The Ruta 40 is the main part of the rally Paris Dakar! We were stopped by a car which had returned, because a huge and deep river rose up few kilometers ahead. No way to pass it now. Consequently we returned and had to drive a minor deviation of more than 300 km! 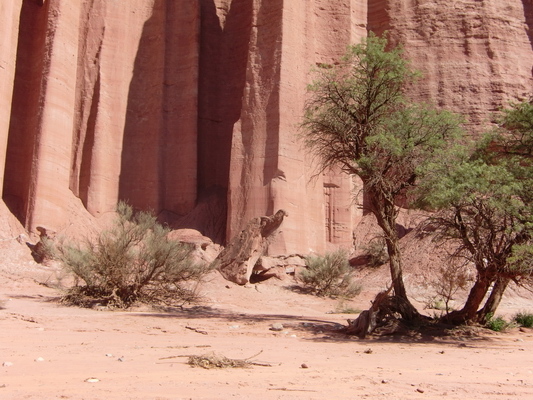 But we were very happy and lucky, because we had had such a lovely day in the Talampaya National Park the previous day. It was also closed: No way to drive into the canyon, even with a four wheel truck.